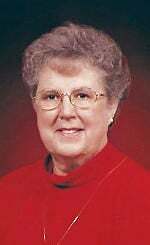 Janesville, WI -- Phyllis (Leith) Allison of Janesville, WI, went home to be with the Lord on April 14, 2019. She was born to Vernon and Julia (Griffith) Leith on December 4, 1938 in Wausau, Wisconsin. She graduated from Janesville High School in 1957. Phyllis married her high school sweetheart, Charles "Chuck" Allison, at First Christian Church on March 14, 1959. She was actively involved in Bethel Baptist Church, where she served in many capacities over the last 54 years and was known as "Grandma Phyllis" to many of the children there. She was previously employed by Parker Pen and retired from Prent Corporation in 1999. She enjoyed spending time with family, friends and church friends, many of whom she considered family. She attended her grandson's sporting events throughout the years, and looked forward to "Jokers Tuesdays." Phyllis and Chuck enjoyed traveling together, meeting their goal of visiting all 50 states, her favorite being Alaska. She is survived by her husband, Chuck; three daughters: Vicky (Efren) Blanca, Teri Allison, Patti (Lawrence) Faus; three grandsons: Larry (Insook) Faus, Nick (Jaime) Faus and Michael Blanca; two precious great-granddaughters, Lorelai and Gabrielle; her sister and best friend, Joanne Driscoll; and many cousins; nephews; and nieces. She was preceded in death by her parents; and brother, Robert Leith. A memorial service will be held at 11 a.m. Thursday, April 18, 2019 at Bethel Baptist Church, 3300 Mt. Zion Avenue, Janesville. Pastor Drew Super and Pastor Jason Eddy will officiate. A visitation will be from 9 a.m. to 11 a.m. Thursday at the Church. Private interment will be in Milton Lawns Memorial Park at a later date. Henke-Clarson Funeral Home is honored to be assisting the Allison family. A special thanks to the doctors, nurses and staff of Mercy Hospital, Janesville, and Mercy Health at Home Hospice staff; Dr. Dena Green, Brittany, Gordon, Lisa and Jessica.